Die Hard on a White House. That’s basically it right there. You have your former law enforcer — here his name is Mike Banning (Gerard Butler) and he used to be Secret Service assigned to protect the President (Aaron Eckhart). During a snowstorm, Some Damn Thing hit the Presidential Limo’s windshield and fishtailed the car nearly off a bridge. Banning was able to save the President, but not his wife, and since the President can’t stand to be reminded of that night, he has Banning reassigned. Okay, then you have your terrorists commandeering a building — here they attack the White House in a cargo plane the same day the President (whose name is Benjamin Asher, and whom I’ll be referring to as Asher for the remainder of this), Vice President, and Secretary of State are meeting with the South Korean Prime Minister. As the gang retreats to the Presidential Bunker, one of the PM’s aides reveals himself as Kang Yeonsak (Rick Yune), a North Korean terrorist with a backstory that blah, blah, blah. He shoots a lot of people in the head and wants to blow up things. That’s all we need to know. You have your former law-enforcer invading the building — in this case, Banning storms the White House after Kang’s goons take out every Secret Service man and Marine on the premises. 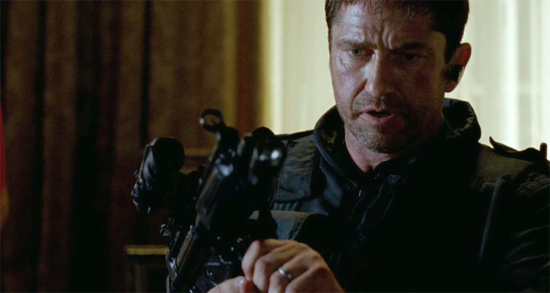 In Olympus Has Fallen the White House has been attacked and only former Secret Service Agent Mike Banning (Gerard Butler) can do anything about it. Previously, we brought you a couple trailers and more for the movie. This time around, we’ve got some new TV spots to share. But before that, and in case you forgot. this one is directed by Antoine Fuqua (Training Day) and stars Mr. Butler as well as Morgan Freeman, Aaron Eckhart, Angela Bassett, Melissa Leo, Ashley Judd, and Rick Yune. Here’s the synopsis: When the White House (Secret Service Code: “Olympus”) is captured by a terrorist mastermind and the President is kidnapped, disgraced former Presidential guard Mike Banning finds himself trapped within the building. As our national security team scrambles to respond, they are forced to rely on Banning¹s inside knowledge to help retake the White House, save the President and avert an even bigger crisis. Check out all the after the break. 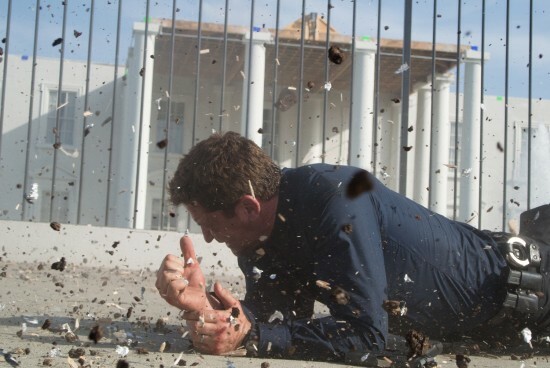 Olympus Has Fallen arrives in theaters on March 22nd. All hell is breaking loose at the White House and only former Secret Service Agent Mike Banning can do anything about it. This is the second “Die Hard in the White House” movie coming out this year (the other being White House Down with Channing Tatum) and we’ve got some videos that will show you all you need to know. This one is directed by Antoine Fuqua (Training Day) and features Gerard Butler, Morgan Freeman, Aaron Eckhart, Angela Bassett, Melissa Leo, Ashley Judd, and Rick Yune. Not a bad cast. Click through for the videos. Look for Olympus Has Fallen to hit theaters on March 22nd. Even with the outcry over violence in movies, games and other forms of entertainment, that hasn’t stopped Hollywood from cranking out violent movies. And it probably won’t for the foreseeable future, if it ever will. So, as they will keep making ’em, it will keep being our job to bring you information, trailers, and more, about them. 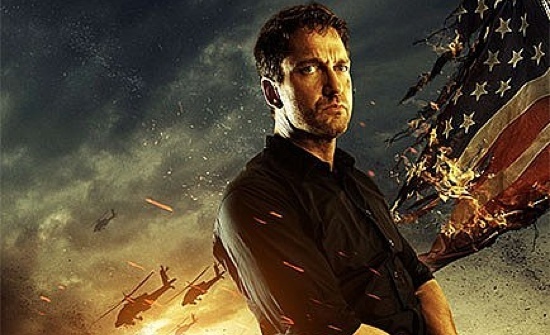 Case in point this time is the upcoming action movie Olympus Has Fallen. Directed by Antoine Fuqua and starring Gerard Butler and Morgan Freeman (sadly, not as The President), Olympus Has Fallen is a “Die Hard-in-the-White House” movie where the President’s pad is overtaken by terrorists and it’s up to a Secret Service agent to save the President. Um, yeah. Wasn’t this the plot of a 24 episode from a few years ago? Oh well, we like badly-in-need-of-a-hit Gerard Butler, so there you go. Check out the trailer after the break. Olympus Has Fallen arrives on March 22nd. Dwayne “The Rock” Johnson has had quite an interesting career in a pretty short amount of time. He’s covered just about all of the prerequisites that his Action Movie forefathers set for him: Sci-Fi franchise, art-house picture, buddy movie, and family film. Those accolades took stars like Schwartzenegger and Stallone 15 years to accomplish, and Johnson has managed to do them in 5. He’s now coming off of the success of Race to Witch Mountain and The Game Plan for another family-friendly film in The Tooth Fairy. In the film, Johnson plays tough guy Derek Thompson, known to his friends as “The Tooth Fairy” due to his aggressive sportsmanship on the hockey rink. Thompson is kind of an S.O.B. to fans, friends, and even his kid, until things get turned around and he is sentenced to serve as an actual tooth fairy. The cast is pretty heavy, throwing in names like Ashley Judd and Julie Andrews, but the most interesting is the addition of Billy Crystal to the cast. This is Crystal’s first on-screen role since 2002’s Analyze That (with brief voice role in 2006’s Cars). It’s interesting that Crystal would come out of the woodwork for this film, but it could have something to do with the film’s screenwriters. The script was done by the writing team of Lowell Ganz and Babaloo Mandel, who worked with Crystal on films like City Slickers, Forget Paris and Mr. Saturday Night. Check out the first trailer for the film after the jump. Enjoy Dwayne, Billy, and the rest of the cast when The Tooth Fairy hits theaters January 22 of next year.